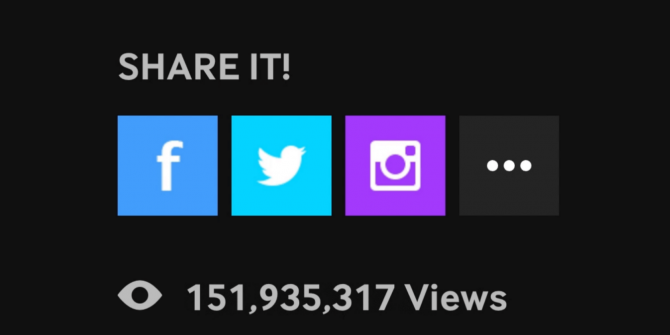 Giphy is adding view counts to its GIFs. These will measure the success (or failure) of the GIFs we all take for granted. With GIFs going increasingly mainstream GIFs, The Language Of The Web: Their History, Culture, and Future GIFs, The Language Of The Web: Their History, Culture, and Future Everything you ever wanted to know about the history of GIFs, how they've evolved, and their cultural impact and significance. Read More , these view counts will allow us all to see which GIFs become part of the zeitgeist, and which just fall to the wayside. In case you hadn’t noticed, GIFs are now very popular. It’s easy to see why: GIFs offer a shorthand way of expressing yourself online without needing to find the right words. In that regard they’re very similar to emoji, but better. But just how popular is your favorite GIF? You can now find out exactly how popular your favorite GIF is, thanks to Giphy. This is because the platform that has become to go-to option for anyone looking to find and share the perfect GIF is adding view counts to GIFs from all of its official artists and partners. This means that every time you view a GIF, no matter how many times you watch it loop, that GIF will rack up one view. And this isn’t limited to new GIFs either, with Giphy reporting that this infamous GIF of NBA player James Harden throwing shade has already racked up 57 million views. Giphy is well-positioned to measure the success of your favorite GIFs. It’s the default platform for GIFs on Facebook, Messenger, Twitter, and plenty of other social networks/messaging apps. Which means millions of users are sharing thousands of GIFs every minute of every day. Knowing how many times particular GIFs have been viewed could be useful too. It opens more possibilities for lists of trending GIFs, we can see which moment from a show like Game of Thrones has proved most popular, and even rank celebrities by the popularity of their GIFs. Emoji may be the language of the internet Can Emoji Transcend Language Boundaries? Can Emoji Transcend Language Boundaries? Will the connected age help us move beyond language as we know it? Some people think that emoji could revolutionize how we communicate. Let's take a look. Read More , but GIFs have their own part to play in this new digital landscape. Emoji are generally used as a way of signing off, and ending a conversation. But a single, solitary GIF can sum everything you’re thinking up without the need for words. Do you regularly share GIFs online? Do you use Giphy? Or do you prefer a different platform? Are some GIFs now so famous you’d recognize them instantly? Or do you prefer to find new GIFs to share in order to be original? Please let us know in the comments below! Explore more about: GIF, Giphy.